The sequel , Guitar Hero ll will be available in Microsoft Xbox 360 due to release on 3rdApril , featuring a guitar-shaped peripheral (resembling a miniature Gibson SG) as the primary controller to simulate the playing of an electric guitar published by RedOctane and teamed up with veteran music game developer Harmonix .The premise of Guitar Hero II remains the same as its predecessor. Players imitate fretting and strumming guitar pattern by pressing the custom five fret buttons on the Guitar Hero™ SG Controller in sync with scrolling “notes” on screen that indicate the rhythm of the song. Players activate these “notes” by flicking the strum bar on the Guitar Hero™ SG Controller, racking up points as you play in time with the music and rocking out to songs like Iron Man, I Wanna Be Sedated , Thunder Kiss 65 or the lights that blind ,you’ll feel just like a Guitar Hero ! 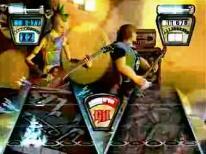 In total, Guitar Hero II features more than 55 songs. New modes include a multiplayer co-op mode where players can play not only the lead guitar track, but rhythm or bass as well, allowing players to take on two different sections of the song simultaneously. The best part about the guitar is that it incorporates most of the real life techniques and motions that a guitarist would perform on a real instrument. Hammer-ons, pull-offs and up-down strumming all work with this device, making the transition from the real thing to the Guitar Hero SG as minor as moving from strings to buttons. This entry was posted on Saturday, March 31st, 2007 at 8:02 pm	and is filed under Interesting Stuff. You can leave a response, or trackback from your own site. 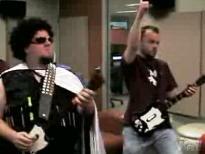 One Response to "Guitar Hero ll – Are you ready to Rock n Roll ?" I do not traditionally comment relating to personal blogs similar to this but in this instance plus in keeping with the help of the remarks previously I might take this probability to say just how much I really enjoyed your write-up. Unquestionably beneficial as well as well written – bless you for sharing it with all of us!